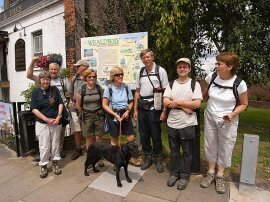 We did this walk on 13th July 2008, walking between the small hamlet of Luddesdown and river Thames at Gravesend which marked the end of not just this stage but the entire Wealdway recreational path as well. For this walk there were the eight of us who had set off from Eastbourne, Anne, Sally, Sara, Maria, Val, Dave, Chris and myself along with Derek who had joined us on stage 2. We parked in the car park by Luddesdown Church, which was much quieter than last week and set off just afer 10:00am. 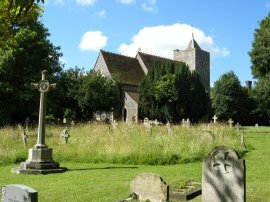 The Wealdway takes a footpath into a field behind the church which soon turns left to head down to cross a small road. 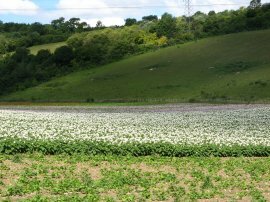 The route heads past the field into photo 2, which was planted witha strip of crop that had white flowers and another strip that had purple flowers although the plants themselves looked very similar. 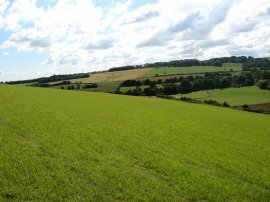 There then followed a short sharp ascent uphill to Henley Down, the only real hill on the day, from where there were good views back over Luddesdown and surrounding valleys, photo 3. 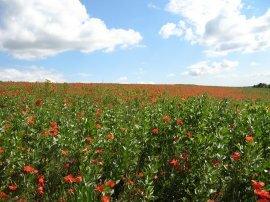 The path runs along the edge of the hedge at the top of the hill before turning to the right and running past a field planted with broad beans, photo 4, although it also contained a large number of poppies as well in amongst the plants. 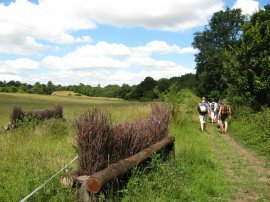 The route then joins a track and makes its way between fields and along the edge of Henley Wood to reach a road on the outskirts of Sole Street. The route heads along the road crossing the railway lines by the station and taking the next road on the left. Where the road bends to the right the Wealdaway continues ahead along a footpath that turns to the right initially running behind the houses, although at first we went straight ahead! The path then continues ahead, briefly joining White Post Lane before heading out alongside fields, photo 5, towards Nash Street. 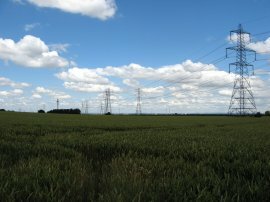 Here the Wealdway joins a broader track running besides open fieldsand under a number of electricity pylons, photo 6, past Ifield Court, towards the Channel Tunnel Rail Link and the A2 trunk road. As we were walking over this stretch of path we got the first views over the Thames Estuary, a few miles ahead. 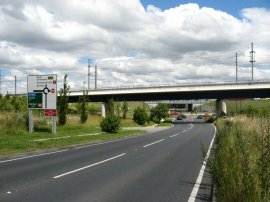 In July 2008 there was still road works going on on the A2 which led to the a short diversion, photo 7, for the Wealdway, the path running parallel with the channel tunnel rail link down to the A227. Here the route joined the road, running under the rail link bridge, photo 8, and under the new A2. 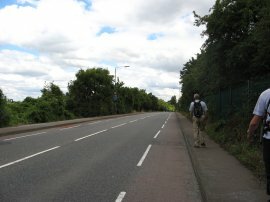 Here the path rejoins the original route and heads under the the old A2, which is gradually being removed, before continuing down the A227, photo 9, into Gravesend, a rather long and unattractive section of road walking. 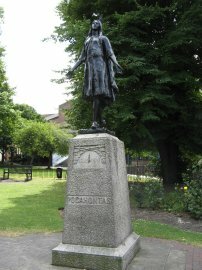 The path makes its way through the centre of the town, photo 10, before turning to the left to pass through the churchyard of St George's Church where there is a statue of Pocahontas, photo 11, who died at Gravesend in 1617. From the church it is then just a short walk down to West Street where the route turns right for the final few yards to the end of the walk by Gravesend pier. 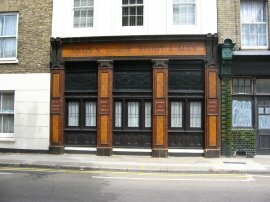 On the way the route passes an attractive old tiled pub front on West Street, photo 12. 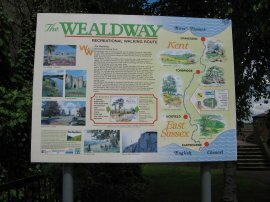 Close to the pier is a noticeboard describing the Wealdway path, photo 13. Gravesend pier, photo 14, is the world's oldest surviving cast iron pier, built in 1834 it is a unique structure with the first known iron cylinders used for its foundation. It has recently been renovated and now has a restaurant on the pier head. 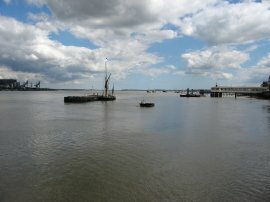 Photo 15 was taken looking down the Thames from the end of the pier. Reaching the pier we had walked just under 7 miles from Luddesdown. 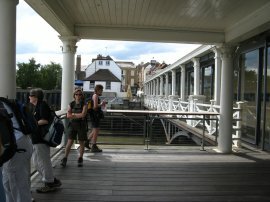 This had just been a short walk and after a lunch stop most of the group set off along the start of the Saxon Shore Way which also starts/ends at Gravesend Pier, eventually ending the days walk at Cooling. 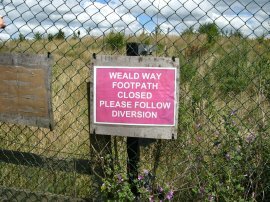 The Wealdway had taken us from besides the English Channel at Eastbourne, over the South Downs, through the countryside to the heathland of Ashdown Forest and on through the Weald of Kent and over the North Downs and on to the Thames Estuary. 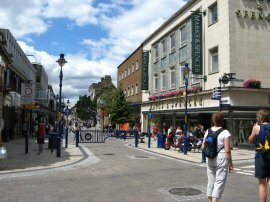 Apart from the final few miles into Gravesend the route generally avoids any long stretches of urban walking. My GPS made the total distance for the walk 81.5 miles although in reality it was probably a few more than this. I had got to see parts of the area I had not walked in before and walking with a group made it easy to walk decent distances each time in area with very few useful transport links, far easier than if I had attempted to undertake it on my own, so thanks to the rest of the group.